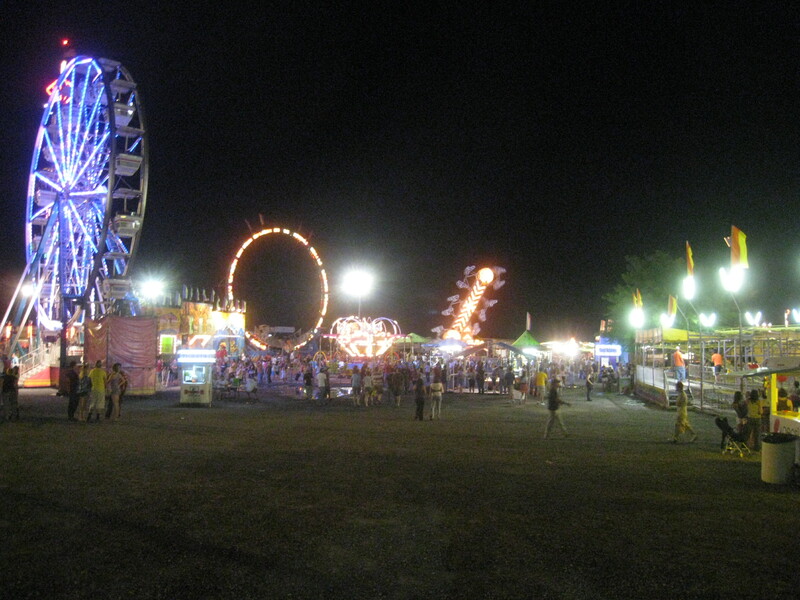 Last night, I made my annual pilgrimage to the Rockingham County Fair. The fair, of course, is many things to many people: a social gathering, a plethora of rides, a sampling of good food, a chance to see a multitude of farm animals, a concert, a tractor pull, and a demolition derby. For me, the fair is another opportunity to promote my political ideology (no great surprise there, huh?). Therefore, like I’ve done on and off since 1995, I volunteered at the Republican booth. Speaking of politics, I guess the highlight had to be a visit from Governor Bob McDonnell. Unfortunately, I didn’t get a chance to see him myself. Nevertheless, I did manage to get a handful of pictures of other things. 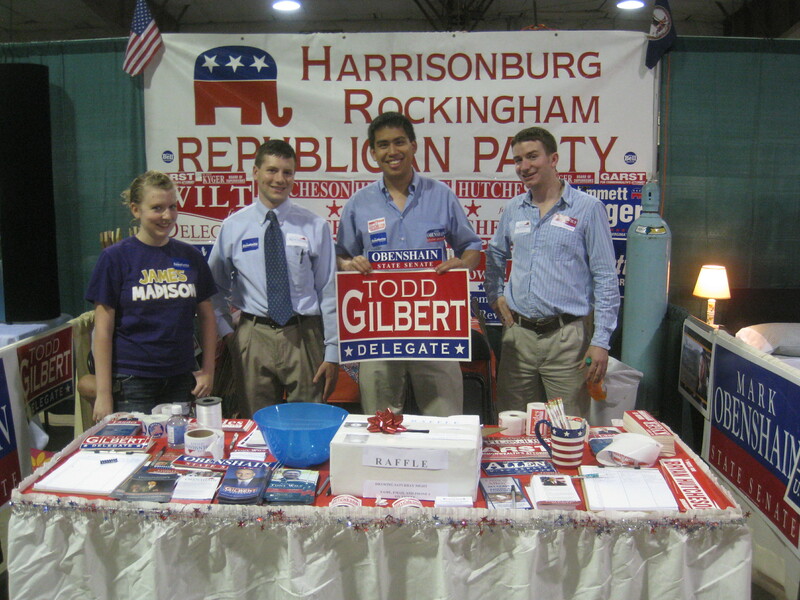 Throughout the night, the Republican Party booth was a hotbed of activity. Many folks were drawn to promise of free balloons and a raffle. One could find materials on about a dozen candidates and there were a multitude of colorful bumper stickers and yard signs. You could even sign a petition to get Rick Perry on the ballot for the 2012 GOP primary. 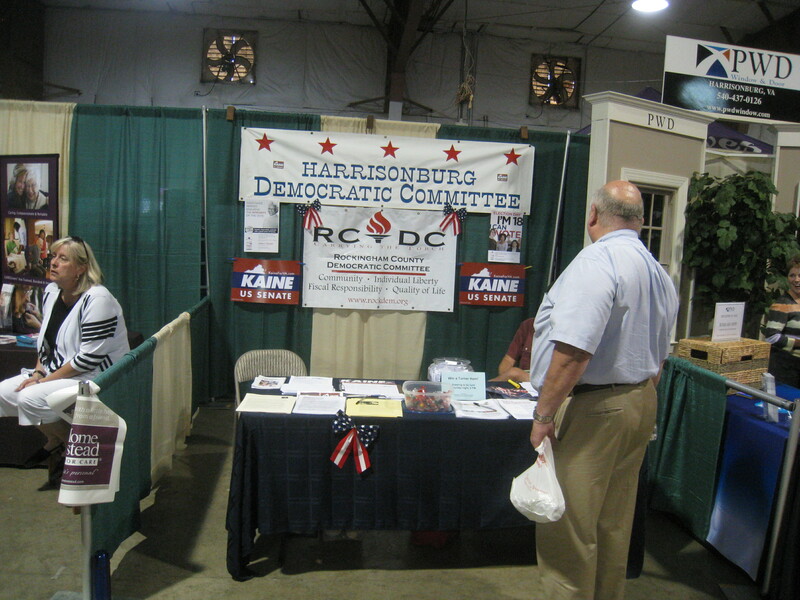 Elected officials and hopefuls who I saw at the booth include: Bryan Hutcheson (candidate for Sheriff), Delegate Todd Gilbert (15-Woodstock), Delegate Dickie Bell (2o-Staunton), Senator Mark Obenshain (26-Harrisonburg), Todd Garber (Treasurer for Rockingham), Ted Byrd (Harrisonburg City Council), Lowell Barb (Commissioner of Revenue for Rockingham), Bill Kyger (Rockingham County Board of Supervisors), and Karen Kwiatkowski (candidate for the House of Representatives in the 6th district). By comparison, things seemed a bit slow at the Democratic table. Given that they have no candidates for the Virginia General Assembly, their main focus appeared to be promoting Tim Kaine for Senator in 2012. Although I won’t claim to have stayed at their table long, I didn’t see any elected officials there. 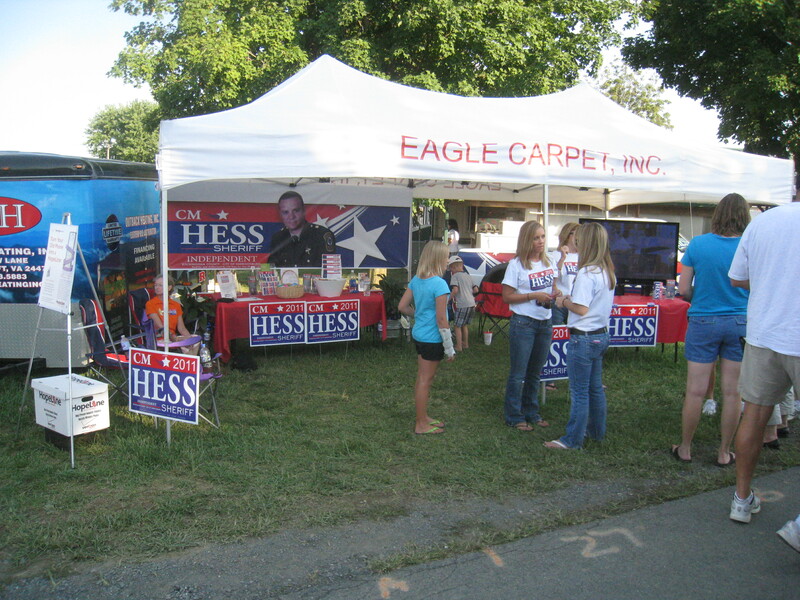 Outside the exhibition hall one could find a tent for Independent Sheriff candidate C.M Hess. They seemed to enjoy steady traffic. I’m very much looking forward to the Sheriff forum being held by the local tea party. You can find more details on that event here in the near future. Overall, the fair seemed to be a well-attended event. There were a multitude of vendors, both food and otherwise, and there was quite a bit to see and do. I hear that the Beach Boys are returning for another concert this coming Friday. The Rockingham County Fair never fails to impress, so, whether you happen to be interested in politics or not, I recommend you head over to check it out before it disappears until next year.